For a few years now, from time to time, I have been coming across attacks against former Reuters reporter Michael Deibert. I have read that Deibert is biased, possibly a CIA operative and/or part of a conspiracy to drive and keep Jean-Bertrand Aristide out of power. Based on experience, I can say that none of these accusations is true. I was National Public Radio's correspondent in the region from 2000 until 2004. During those years I traveled to Haiti about 10 times. I first arrived there on the eve of the May 2000 legislative elections and last went in June of 2004 as United Nations troops were taking over control of the country from the U.S. Marines. In between I covered the presidential elections that brought Aristide back into office and various events during his truncated tenure, including the unrest that led to his flight from the country on February 29th 2004. I saw a lot of Haiti in good times and bad, but I did not become an expert on Haiti. It goes without saying that to be an expert on Haiti, or on any country for that matter, you have to live there. That said, I tried to report fairly on Haitians and their struggles. Often during that reporting I worked alongside Michael Deibert, then a Reuters' reporter based in Port-au-Prince. We travelled together on more than one occasion to Gonaives - once to interview members of the Cannibal Army shortly after members had sprung their leader Amiot “Cubain” Metayer from the local jail. We also visited the Plateau Central together, interviewing everyday Haitians about their lives and their government. On one trip we sought out members of the so-called 'rebel' army as it advanced towards Port-au-Prince in early 2004. We worked together on countless occasions in the capital and made trips down to Jacmel and other areas. What I admired about Michael's work in Haitii was his utterly normal way of living and working. He tended to stay away from the luxury hotels where other journalists hung out. He lived in a modest house in a neighborhood that could not be described as exclusive. He walked everywhere downtown, he learned to speak Kreyol, he made many Haitian friends - I'm not talking about government ministers or business leaders but just normal Haitians. He became carried away by Haiti (who among her visitors isn't?) and always had the country's best interests in mind as a reporter. He longed to see strong institutions take root, to see corruption curbed, international bullying and realpolitik checked and real economic growth established. There seems at times to be some confusion as to what a reporter's job is. It is not to take a side in the internal political struggles of a nation. That's the job of the local citizenry. A reporter's job is to report as fairly and accurately as possible on what's going on. As Haitian history evolved so did the stories that Deibert wrote. That is normal and natural. In 2000 we were all writing stories that portrayed the hope of Haitians with 'Titid' back in the national palace. That hope was palpable, citizens expressed it with dizzying joy. Then things began to change. There are many interpretations of just what happened and why. It is not my intent here to explain the tangled events that led to the fall of Aristide's government. What I want to say is this: Michael Deibert is not and never was an enemy of Haiti. He shed a lot of sweat walking around the capital and countryside, from Cite Soleil to Cap Haitien, and he wrote about what he saw and what people told him and what he could learn via investigations. He helped a lot of people too, with small gestures, with food, with money, and most of all with the kinds of favors that neighbors do for each other and which never get recorded in history. To my mind he never took a side. As time went on the voices critical of Aristide began to grow louder. Deibert reported on that, and investigated their claims. And he tested the claims of Aristide's supporters. During the last two years of Aristide's presidency, both Michael and I witnessed many acts of intimidation and violence against carried out by people claiming to be acting on Aristide's behalf. I personally knew young men from the slums who were armed and on the payroll of police leaders close to the National Palace; these young men were on call to defend the palace against protesters. During the marches against the government in the weeks before Aristide fled, these young men stated that they were paid to attack the anti-Aristide protesters. Later they were abandoned by the government or killed in what appeared to be an attempt to silence them. The Cannibal Army itself was initially a self-proclaimed pro-Aristide gang. Its leaders only turned on the president after leader Cubain's heart and eyes were cut out. The Cannibal Army had big guns before they switched sides. In St. Marc one afternoon during those final days I interviewed bands of Aristide supporters also armed to the teeth with heavy guns - and even grenades. They were trying to 'root out' his opponents. Later that afternoon they carried out a massacre; other foreign journalists and photographers reported that they did so side by side with member of the Haitian National Police. Several local journalists also told me their stories about being threatened or attacked for being critical of Aristide during those final two years or so. As time went on reporters based in and outside of Haiti began to realize that the situation was growing unbearable on the ground. Whether or not President Aristide was directly responsible for the rising chaos and the atmosphere of intimidation is a matter of debate about which I am not qualified to argue. There were countless wrongs committed on the other side too. A strong argument has been made by many that without U.S. and international support Aristide never had a chance to turn his country around. With aid suspended an institutionally weak country only unraveled further, with corruption and drug smuggling flourishing. Seeing no way out, Aristide may have been driven to seek support from less than honorable people. Again, there were many such characters who acted in Aristide's name and contributed to the sense that his government was not following the rules of democracy. Deibert wrote about all of the events and injustices that were taking place, not just those that hurt Aristide's cause. To do otherwise would have been a violation of journalistic principals. It's unfair to suggest that he was a stooge for those members of the international community who stood against Aristide. 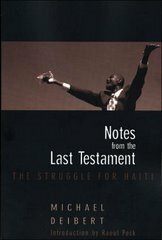 It is even worse to imply that he somehow has contributed to Haiti's suffering via his writings. Everyone who cares about Haiti shares the same goal, to see the situation there improve. We can tone down the debate a little without losing critical judgment. Thank you.